GK Paris to compete in CPL! GK Paris join the CPL! 2014 sounds like a big challenge for Team GK but we are ready!. As you can guess we immediately jumped at the opportunity to compete in the highly and competitive CPL division of the Millennium Series when our sponsors offered to help us to acquire one of only 16 CPL licences. This marvellous challenge is possible thanks to the support of GI Sportz Paintball﻿. Our new sponsor and partner provides the team with GI pro gear, the mighty new GI Victus, the new GI RDR hopper and the legendary V-Force Grill mask. Last but not least we will be shooting GI Sportz 5-Star Imperial paintballs, the best paint with the most podium finishes in the World! We would also like to thank DROM paintball for the support and sponsoring our team with their new reliable and comfortable DROM 2.0 cleats. With the support of all our sponsors, coaches, families, friends and fans we will give everything we have this season to prove we are competitive and belong in this division. Moreover you will be able to find us every week at Eastwood Paintball, our home practice field. We wish to thank the field owner and friend Miguel Melendo allowing us to practice on this great natural paintball field. Please follow us this season through Xpaint, One 4 One, Spirit of Paint and of course on our Facebook page. Thank you and the team looks forward to a great season2014 sounds like a big challenge for Team GK but we are ready!. "We are extremely proud to announce that a huge opportunity was given to team GK by competing with the most prestigious teams in Europe. 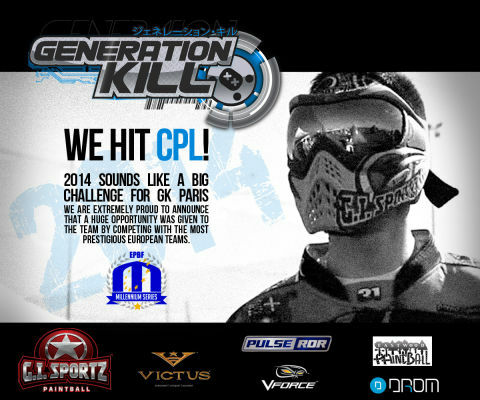 This marvellous challenge is possible thanks to the support of GI Sportz Paintball﻿. Our new sponsor and partner provides the team with GI pro gear, the mighty new GI Victus, the new GI RDR hopper and the legendary V-Force Grill mask. Last but not least we will be shooting GI Sportz 5-Star Imperial paintballs, the best paint with the most podium finishes in the World! Please follow us this season through Xpaint, One 4 One, Spirit of Paint and of course on our Facebook page. Thank you and the team looks forward to a great season!"